There is so much content published these days that it is difficult to stand out and get engagement. One way to break through is to create cornerstone content, which is authoritative and referenceable, as part of a ‘less is more’ content strategy. The content can range from comprehensive surveys or lists, to annual reports such as Mary Meeker’s internet trends report. This cornerstone content is what Rand Fishkin calls 10x content. It is so good it demands the attention of your audience. We were aware that posts about headlines resonated well with our audience. A post we wrote last year on how to write viral headlines gained 3,900 shares and 147 links. A post by Social Media Examiner on headlines also gained over 10,000 shares. We believed there was an opportunity to create a piece of cornerstone content that would be better than the existing content out there. 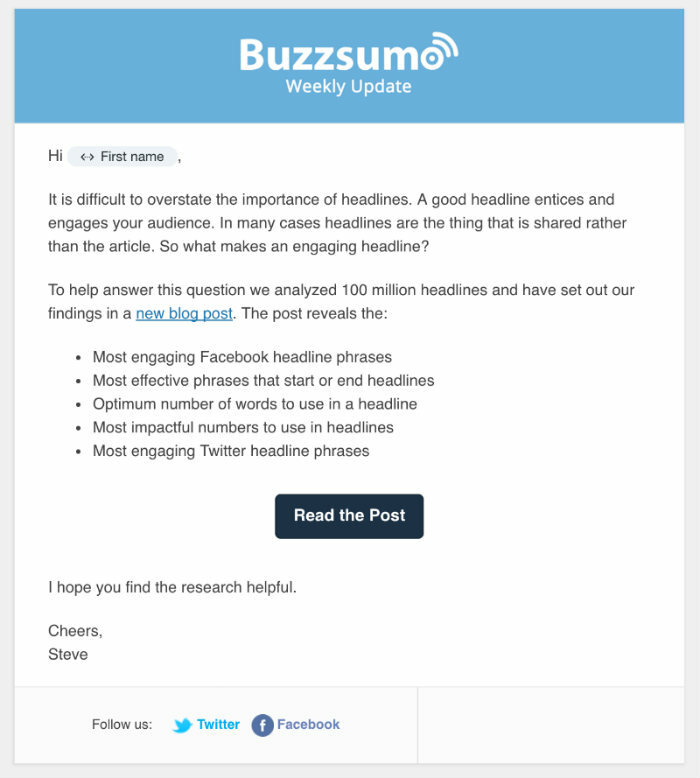 We therefore decided to undertake a major research project reviewing 100 million headlines in our BuzzSumo database and publish a comprehensive post on the headlines that drive engagement. You cannot publish content and hope people will find it. You need a promotion strategy. Paid ads, primarily Facebook, as the content was directly relevant to this audience. Here are the details of what we did with the results and lessons we have learned. On the morning of the post, at 7:00 AM EST, we sent an email to all of 200,000+ BuzzSumo users, including those who had previously signed up to the free trial but were no longer active. The mail is below. That same morning, we created two Facebook ads: one for publishers and their employees, and one for BuzzSumo users, the majority of which were our freemium users. Below is one of our ads. In summary, we spent $648.00 on Facebook ads that drove over 2,000 clicks and which also resulted in 3 new paying customers. 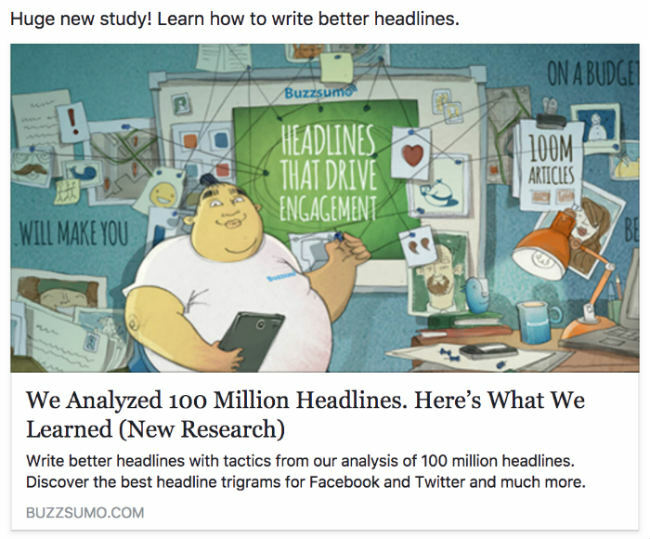 The retargeting of Buzzsumo users was the most effective ad strategy as it resulted in more clicks, but a lower CPC. By contrast, our Twitter ads targeted at publishers were far less effective, gathering just 29 likes or clicks for an outlay of $151.00. We built a Twitter audience using BuzzSumo’s influencer tool. We searched for Twitter users with publisher handles in their bio (using queries such as @buzzfeed OR @mashable). Our targeted audience only consisted of 15,000 or so twitter users, and was probably too low on reflection. We contacted a number of leading influencers and journalists about our research before publishing. We asked them what they would like to learn from the study. For example, my colleague Henley’s email with Shan at Nieman Labs prompted us to look at the impact of character length on headlines. Here is the email he sent to Shan a few weeks before we published the post. This feedback prompted us to include more detail on the optimum length of content headlines. We sent around 20 of these short emails to various journalists, and got a lot of useful feedback and ideas, which we incorporated into our research. We shared the early findings with our influencers and sought their comments and insights. The content influencers we engaged with included Ann Handley, Michael Brenner, Andy Crestodina, Larry Kim, Robert Rose and Heidi Cohen. We included many of their comments in the final post which enriched the post and our research. A good percentage of our engagement resulted in high-profile placements, and links. For example, we were subsequently written about in Nieman Labs, Inc. Magazine, MarketingProfs, and Forbes. These were the result of influencer/journalist outreach prior to publishing the post. Engaging with influencers and journalists prior to publishing also helped us validate our idea. All of our emails included the preliminary title of the post (“Analyzing 100 million headlines”). If nobody responded to our emails or questions, that probably meant there was little interest in the idea, and it wasn’t worth pursuing. But in fact, many people responded, and gave us confidence this was a content idea worth writing about. We published the post on a Monday and pushed our multi-channel approach heavily on the first day, namely direct mail, paid ads, social sharing and influencer sharing. The traffic to our blog during the first week was as follows. The post got immediate traction on the first day, Monday 26th June, with traffic peaking on day two. In the first three days we can see the social networks driving large volumes of traffic. On day two social traffic was greater than any other source. However, by days four and five social traffic was declining markedly. 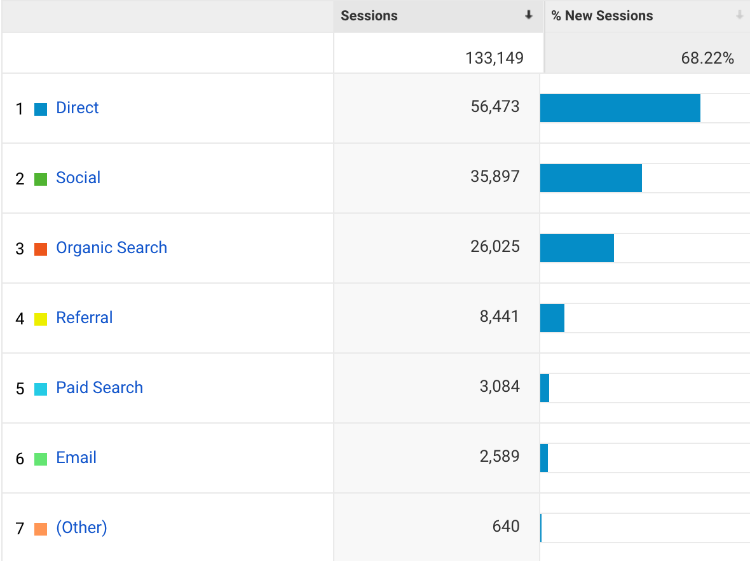 One lesson we take away from these results is the importance of publishing your cornerstone content early in the week. From our experience social engagement peaks for just a few days, after which another story or article may take over. Longer term the traffic may come from organic search but initially traffic is more likely to come direct, via social or referrals. We may have made a mistake in publishing the week before the US 4th July holidays, as this made it difficult to sustain the momentum into the second week. The advantage of promoting your content in multiple channels is that you maximise the chance of prominent people seeing your content. In our case it was picked up by Kevin Roose of the New York Times whose tweet was retweeted over 600 times. This tweet was picked up by a writer from Slate who contacted me for more information and subsequently wrote up a post on our research. 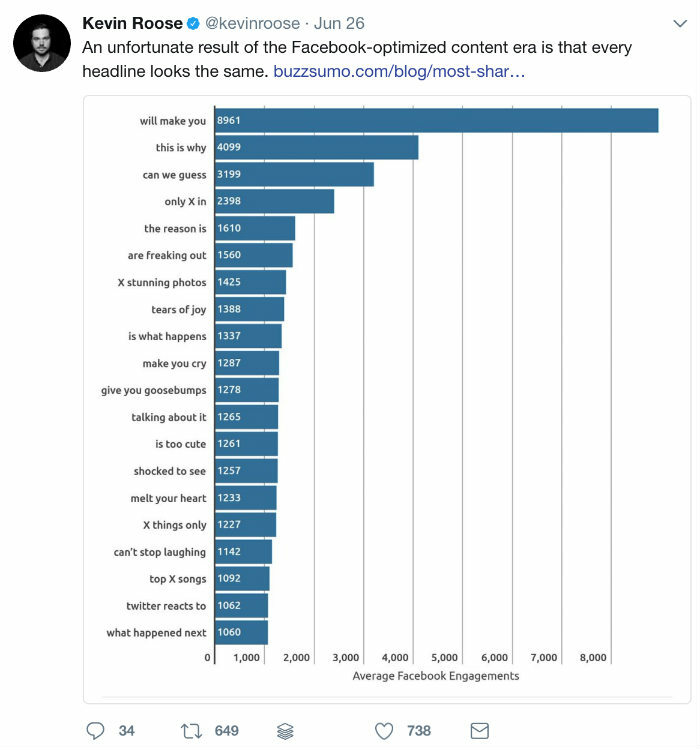 The post itself also created a challenge for influencers and content writers to create headlines using some of the insights from the research, which many readily accepted, for example. While social sharing is not correlated to backlinks (we did a study on this), this does demonstrate that social sharing can result in backlinks, especially if it’s shared by the right people. This reply was on a LinkedIn post by Andy Crestodina, one of the influencers we had involved in the post. We also got invited on to three podcasts to discuss the results of our research. As we anticipated, most of the traffic to our post in the first week came directly or from social. The surprise for many people I think would be how much of our traffic came from Facebook. 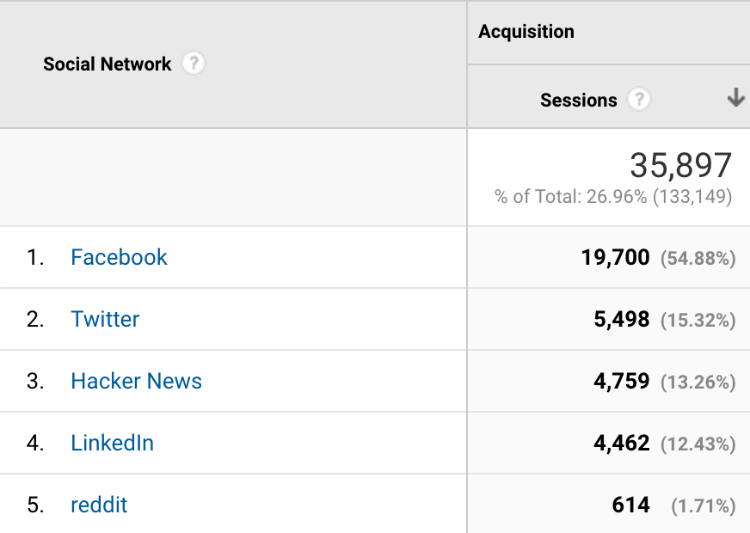 The traffic from Facebook was significant, three to four times that of other networks as we can see below. In our experience original research posts are one of the best forms of content to gain backlinks. In our case the post gained over 2,000 links from more than 100 different domains during the first week. Given how difficult it is to gain links (most content published on the internet doesn’t get a single link), it is very powerful to create content that gains links. You don’t gain links as fast as you gain social shares. Shares tend to take place quickly as it is easy for people to share content. Linking to content takes longer as people have to write posts where they want to reference your content. In our experience links build more slowly but they have a far greater impact on your content’s authority and longevity. We would expect our link numbers to continue to grow significantly over time and we have already seen this with links from a further 100 domains in the second week after publication. Finally, we anticipated that people would want to reference and reuse our charts. Therefore we made sure our logo was added to each chart along with the link back to the original post to ensure people can find the original research and that we gained maximum exposure. Below is an example of the footer we used on our charts. Produce cornerstone content, 10x content or whatever you call it. This exceptional content is very important in driving shares, links and traffic. It can take time to create as it is often comprehensive and long form. You also need to spend time studying what types of content worked well in the past (Hint: BuzzSumo works well for this). It took us a few days to think of this idea and validate it. People love data, especially if it can tell a story that resonates strongly with them. Do you own any data that can be used to tell stories? Can you crawl data from other sources, aggregate it and publish your findings? Here are five ways to create engaging data driven stories. Your content needs a promotion or amplification strategy that uses multiple channels such as direct mail, influencers, journalists, paid promotion and social. Involve influencers/journalists before you even start creating your content. Solicit their feedback and incorporate their suggestions into your content. Validate your idea by sending out emails with the subject of the article as the email subject, and see if you get any responses. Sharing links on your Facebook and Twitter accounts is not enough. Very few people are going to see the links or click on them with organic reach so low. You need a paid strategy now. Paid retargeting improves the chances your audience will see your content. Paid ads targeted to journalists can be particularly powerful since these people have a huge audience and talk to each other. If just one or two of them see your content it can result in a valuable link or share. Even if you are a B2B marketer make sure you test Facebook as a channel for promotion. In our experience Facebook really is the better place to buy ads because of its huge audience and better targeting. Our Facebook ad had a 3% CTR, while our Twitter ad had a pitiful 0.44% CTR.. Publish content early in the week to maximise promotion and traffic over the first 4-5 days. Research and reference content gains links. These build more slowly but give your content authority and longevity. Thanks, I hope it is helpful. Awesome post. Love the tip on sending email to influencers before releasing content. Helped you tailor content to what they wanted. Hi Ash, thanks. Yes, ideally I think you should look to co-create content if you can. I appreciate the write-up. So many valuable insights. Loved the original post and this is great insight into how you made it happen. Thanks! Hi Shawn, thanks. I just hope the insights are helpful. Super interesting, thanks for sharing. One question – what was the quality of the Facebook traffic that you got from paid / social referrals? At Amino (we’re a Buzzsumo customer!) we see a lot of success with referral traffic from Facebook to our content, but it’s not high-intent traffic (ie, high bounce rate, low time on page). Trying to figure out how to optimize for higher intent / engaged audience. So our paid traffic only got slightly lower time on page and a slightly better bounce rate. I think the key was our specific targeting. Bounce rate always tends to be high for blog content, naturally people are desperate to get back to their Facebook feeds after reading 🙂 90% is our average across all blog posts so even a small 2% improvement is a good sign. You’re welcome! I think it’s unrealistic to expect conversions after someone just reads a blog post. Content marketing is really a long game. Thanks for sharing the roadmap. This is a solid process. Thanks for this, Steve! Love the insight into how it all worked for you. Thanks Mike, as I say we are still learning but I thought it would be helpful to share what we did. This post is even more helpful than the one that went viral, so thank you! Thanks, I tend to agree with you, though I find these more in-depth practical posts have less mass appeal and gain less shares. However, they do tend to find a more specific audience. Very interesting article! would be nice to see in a month or two how the traffic has spreaded and from the organic traffic what were you able to rank for with the viral content. Thanks, we will certainly keep this under review. Love this analysis and the lessons learned – thank you for sharing! Just a thought – you said you knew that Social Media Examiner saw a good response to their article on headlines, yet you didn’t run your Facebook ads promoting your article, to an audience that ‘liked’ Social Media Examiner? Thanks, that’s a good point we could have tried that. We are still learning on FB ads, we should have come to you fro advice! Hi Steve – thanks for your kind words – I wasn’t meaning to suggest that, but I’d love to chat through strategies with you sometime – there’s massive potential to be tapped into!! Steve, this post is very timely – it followed so quickly on the heels of the actual piece that I recalled seeing it last week and of course I had to click here to see how you did it and what lessons I could learn myself. Have heard great things about Buzz Sumo and this sort of insight helps solidify that. Hi Lisa, thanks. Do let me know if you need anything. Hey Steve this is the beast post i have read throughout this week. Great article Steve! Kudos to you and the team for such an impactful piece of content. I enjoyed every part of it, I’ll be sure to reference it over and over again in my client’s current (and future) content strategies! Thanks for sharing all these tips Steve! 🙂 I was wondering what is your best tip when reaching out to influencers? My best tip is to start with what can you do for your influencer? I think you need to provide value as part of building a relationship before you can ask the influencer to do anything for you. I have a new blog http://sasibinu.com and it’s really worthy idea to use these tips in my new blog? This article is absolutely incredible. Wow! I have a few clients whom would love this. I’ll send it to them! 🙂 I’m with one of my students in NYC (right now) and this article spurred a nice discussion about how inbound marketing and content can build brand equity. Hi Daniel, thanks, do let me know if we can help in any way. Greetings from Brazil!! Sharing it with the team now..
Do you ever gate any content, particularly cornerstone content? Thanks, we don’t currently gate any content. I personally think there is a big opportunity for short form quality content. It is easy to write longer form content in many ways, summarising and synthesising content into a shorter summary takes a lot of time. I think the evidence from our B2B review is that business audiences prefer shorter content. Thanks Steve, I see you have responded to every comment which is great to see!